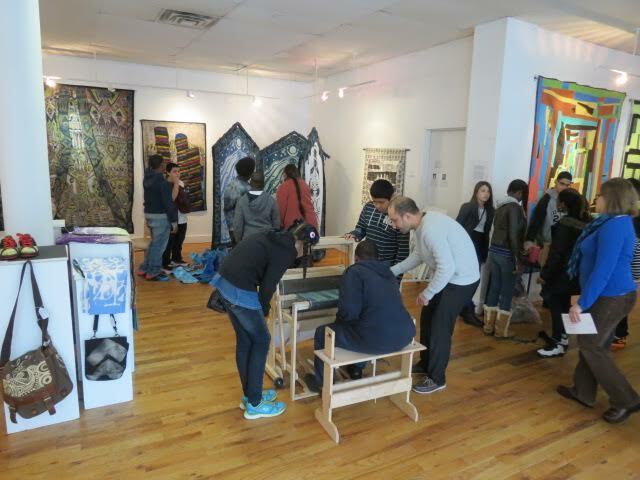 Gallery visit to City Lights: Students are introduced to weaving and view the exhibit COMMON THREADS, a fabric art exhibit that included Gee’s Bend Quilts. Annual City Lights Fundraiser was held at Captain’s Cove on Thursday, September 17, 2015, 5:30-9 pm. Food, Drink, Music, Art, Video, Fun and Surprises! Cost information is listed below (and you can use our PayPal system to support this event). Help us continue our 11+ year mission to serve our Community through Art and insure our outreach programs for area Youth and Adults continue. City Lights programs include: The Bridgeport Arts Trail each November, Painting and Weaving Workshops with Alpha Community Services, Integrating Art & Natural Science with local Elementary, Jr. High, and High School students, Chess workshops for youth, Bridgeport Mental Health Art Therapy Workshops …as well as providing opportunities for area artists of all levels, backgrounds, and abilities to present, sell, and experience Art. Please consider donating a small postcard size piece of art for our teacup auction on September 17, 2015. Thanks to all for your financial support!